A sterile, preconstituted solution of the broad-spectrum antibiotic oxytetracycline. 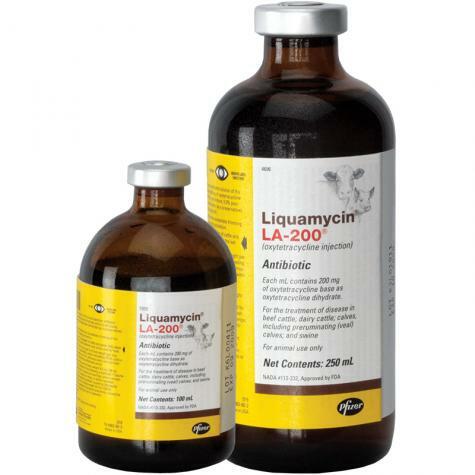 Each ml contains 200 mg oxytetracycline base as oxytetracycline dihydrate. Made for Pfizer Animal Health in Brazil. Ingredients: 40.0% 2-pyrrolidone, 5.0% povidone, 1.8% magnesium oxide, 0.2% sodium formaldehyde sulfoxylate (as a preservative), monoethanolamine and/or hydrochloric acid as required to adjust pH. See label above. Store between 59-86 degrees F. Keep from freezing. Exceeding the highest recommended level of drug per lb of body weight per day, administering more than the recommended number of treatments, and/or exceeding 10 mL subcutaneously per injection site in adult beef and dairy cattle, and 5 mL intramuscularly per injection site in adult swine, may result in antibiotic residues beyond the withdrawal period.